In the previous section we learned how memory can repair its hardware using a computer technique called XOR. XOR will protect memory and keep it perfect indefinitely. XOR allows data to remain intact when hardware fails. This gets us through life’s injury and disease. Although remembering may be affected, underlying memory remains perfect. There will come a time however, when memory hardware failure catastrophic and data cannot be recovered. What happens to memory when power is turned off at the end of life? The answer lies in perspective. During life we move through time always staying in the present. When power is turned off in a computer for example, the computer stops in time. We, on the other hand, move forward in time. From our perspective, now in the future looking back at the event, it appears as though memory is lost. We draw this conclusion because memory is no longer with us. It was there in the past but it is not with us now. Inside the computer, at the moment power is turned off, you stop in time. You now reside in that last moment and longer move forward. From the perspective of that moment you have memory intact. You do not have memory one moment after that moment but that is irrelevant. At the precise moment power drops memory exists. The same holds true for all living things. At the last moment in life, when power is turned off, all memory exists. Memory and awareness, in the human condition, is remarkably similar to memory and processor in computers. In life we have a central point of view (represented by the processor) that is surrounded by memory. The computer “runs” by processing instructions through the processor. With respect to time, the computer executes instructions in the present. Similarly as we move through time awareness stays in the present. The computer’s current point of awareness is demonstrated by the instruction it is processing at the moment. Thus the computer’s awareness remains in the present. Our awareness is the same way. During life it remains in the present. 1. The processor is as shown as a black point at the center of the system. 2. The processor operates from fixed location within time and space. 3. The surrounding memory space is the processor’s environment. 4. The processor runs in its environment surrounded by its environment. 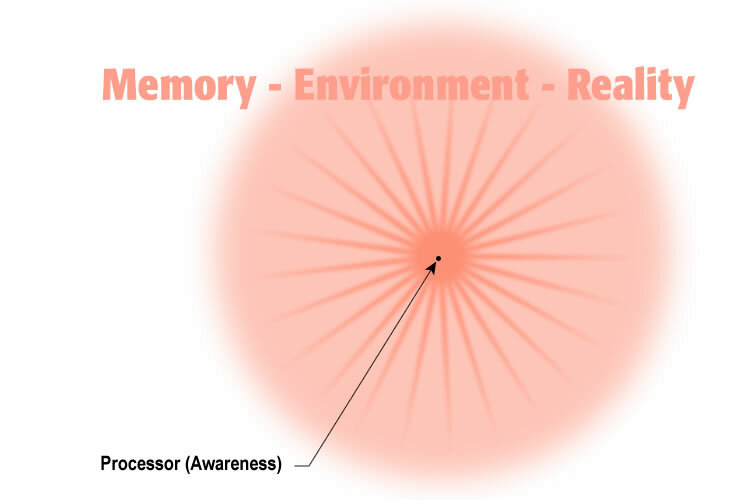 The human mind is made up of awareness as represented by the processor and the environment as represented by memory. Every memory location within surrounding memory space is directly accessible by the processor. Directly accessible means the processor can write or retrieve data from anywhere in memory on a single beat of the clock. The processor is “connected” to all its surrounding memory. The section above represents the present. As soon as it is experienced the present moves into the past. First the moment is experienced in the present. As it does it gets absorbed into memory. 2. Every detail of the environment gets absorbed and filed into memory. 3. We do not notice this happening. It happens in the background. 4. The environment around us is already in memory as we experience it. 5. There is nothing in the outside world that is not absorbed into memory. 6. Once in memory the moment is retained indefinately. Each reality is filed away in memory on each beat of the clock. Memories of past moments are retained intact. Nothing is thrown away by the mind. The fact that you cannot remember a moment of the past does not invalidate this concept. It merely means that you are unable to remember it at this time. Elderly people can recall moments that occurred 50, 60, or even 70 years ago in great detail. The mind retains its memories intact. Humans are memory machines. Like a computer, we retain information absorbed into memory. Computers do not discard information. Likewise humans do not discard information either. 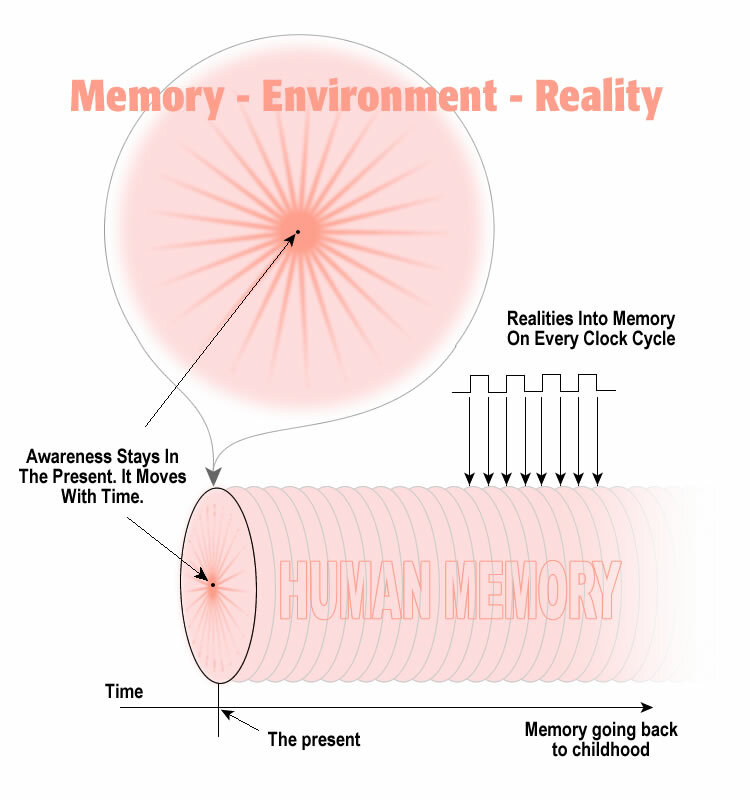 Human memory retains time and space. All of it. Nothing is lost. Everything exists in memory all the time. Experiencing reality is filing it away in memory. Movement through time creates an accumulation of time and space. While life unfolds to us in single moments, we are accumulating time and space. During life we see only the front edge of out time-space continuum, however that entire realm exists within everyone. In a computer when power is turned off all memory exists. The next moment memory is lost, however at that one moment everything exists. In humans however, time itself has been captured into memory. During life we absorbed everything from moment to moment into memory. At the last moment of our life (when the power is turned off) the accumulation of all these moments exist. That one moment at the end of life contains all moments of your life. That one moment at the end of life contains all time. The key to understanding afterlife is to know memory is perfect. It is time. Your memory contains everything you have experienced from the beginning to now. Computers are dependent upon circuits, wires, and electricity. Even so, when we pull the plug the computer still holds all its information. For that one moment, the moment before the power drops, the computer transcends physical time and space. For only one moment the computer holds all its information. One moment is all we need. Afterlife is the same. For that one moment at the end of life we transcend time. From the perspective of the person on the inside all time and space still exists. This is not dependent upon the physical body. Life takes place in the mind. Afterlife is memory. Memory is all space and time.